Never happened before and may never happen again- it’s a family reunion “Black Friday” sale! This year Family Reunion Helper is giving you a jump start on your 2018 family reunion. 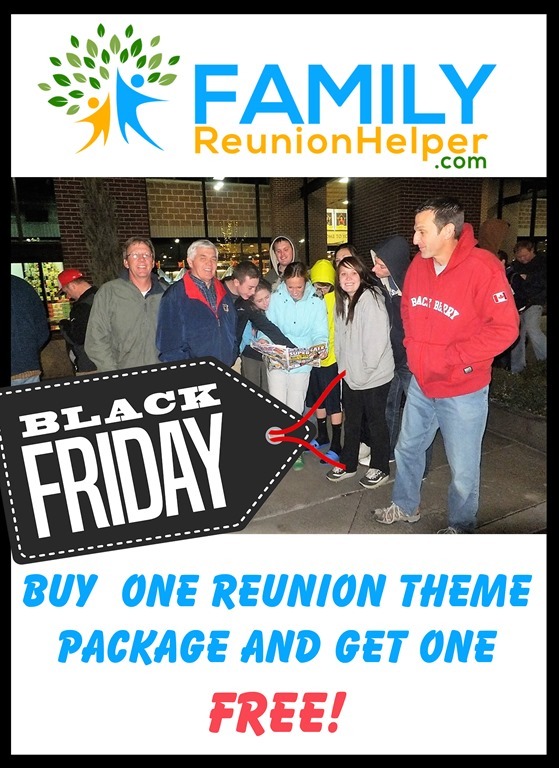 Buy one family reunion and get one family reunion theme package for free. Purchase any of our family reunion theme packages through our website store- www.familyreunionhelper.com. 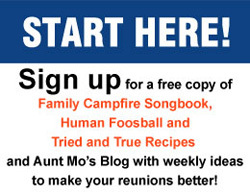 When your purchase is complete send an email to auntmo@familyreunionhelper.com with the name of the reunion theme you’d like for FREE and Aunt Mo will email your free reunion theme package to you within 24 hours. This offer is good today through midnight (mst) November 25, 2017. 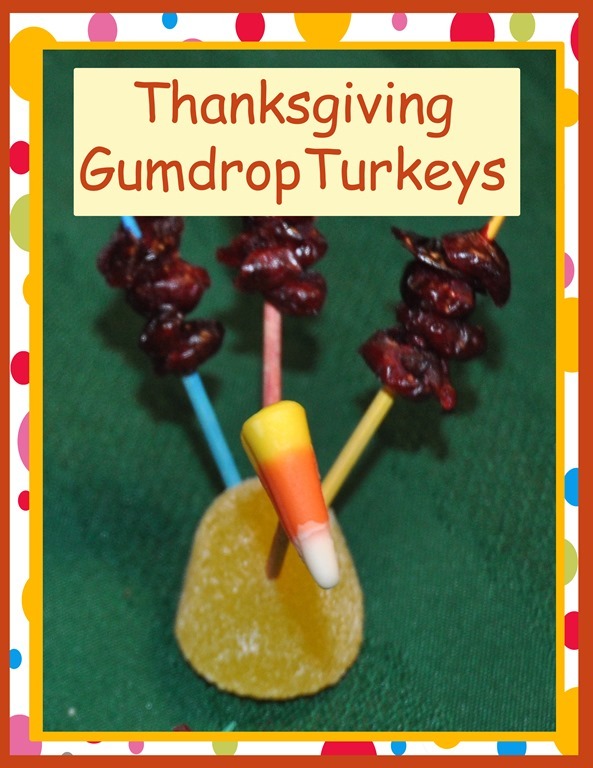 Thanksgiving gumdrop turkeys for your Thanksgiving table. I’ve searched all over the internet for gum drop turkeys as cool as the ones my brothers and I made when we were growing up, but it appears those turkeys were one of a kind creations from my Mom. My Mom always put her four children in charge of making the 30- 50 gum drop turkey favors for our Thanksgiving family gathering. The turkeys were so simple to make that we required no supervision and popping a few raisins or candy corns in our mouth as we were creating them took the edge off our Thanksgiving hunger. 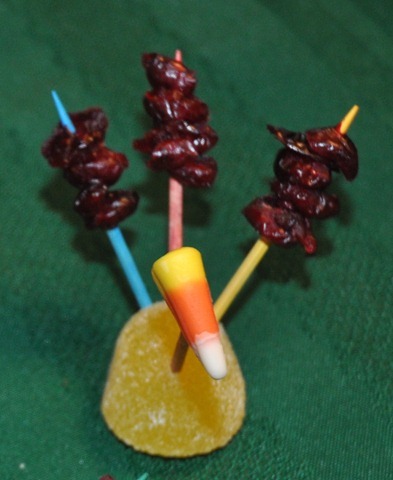 In fact, making gum drop turkeys soon became a tradition at my house when I had children of my own. Over the years I exchanged the raisins we used to use for Craisens and brown toothpicks for brightly colored ones. 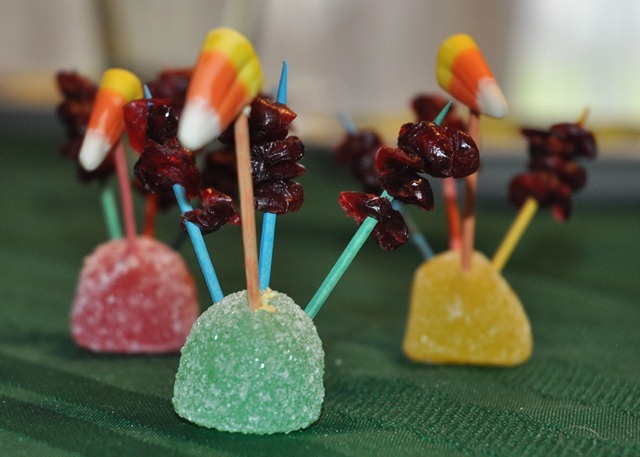 Hint- always use Braches candy corns- they are softer and don’t crumble as easily when you stick a toothpick in them. 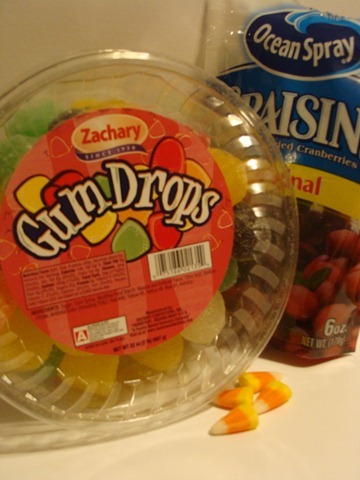 Large gum drops can be difficult to find, but after extensive searching, I was able to find some on the bottom shelf, hidden behind a garbage can, (no kidding) on the Wal-mart candy isle. As I was writing this blog, my 32 year old son walked into the kitchen where I was taking pictures and said, “Gum drop turkeys, I remember making those!” Just proves that something doesn’t have to be expensive, complicated or elaborate to make a lasting family memory. 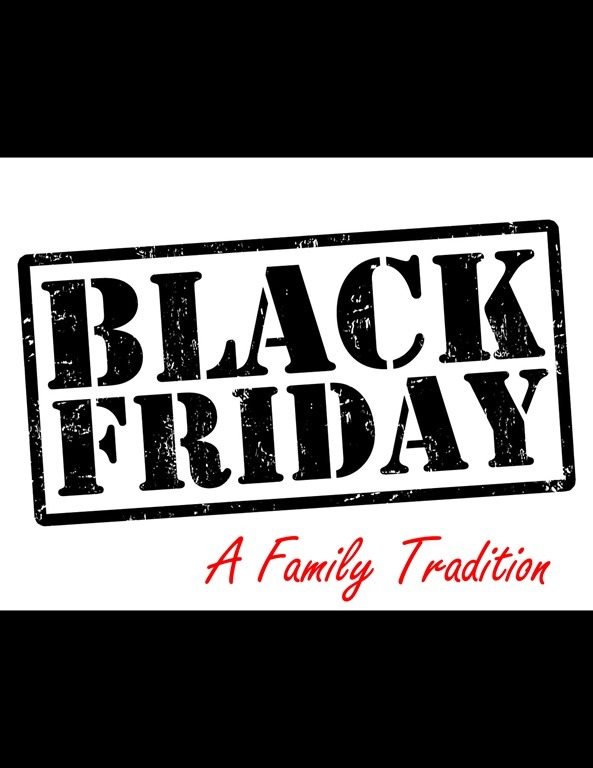 For our family, Black Friday shopping is a Thanksgiving tradition as rich as turkey stuffing or pumpkin pie. We wake before the crack of dawn the morning after turkey day and start hunting down Black Friday bargains. I know that many of you are shaking your head in disgust right now- for many people staying up late or getting up in the wee hours of morning seems ridiculous to you. I’ll be the first to admit that you have to be a little (maybe a lot) crazy to get up early and be standing in a long line by 5 a.m.- in the cold, and the psycho crowds…and quite honestly I have never seen the crazy crowds that the media reports picture. 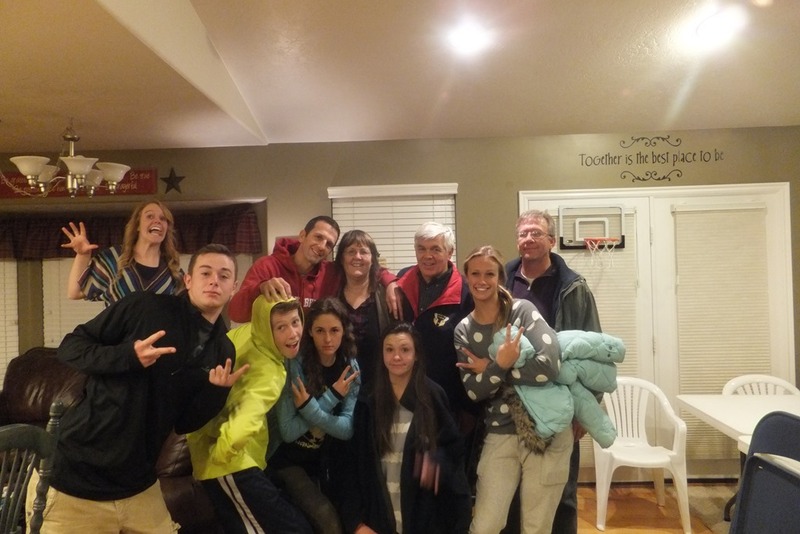 For me, it’s not about the bargains out there or the money I might save- it’s about the silly family memories we make. 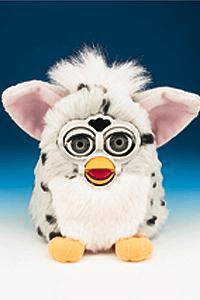 In our family we enjoy remembering the time Uncle Lee almost got trampled (Well, not really but it makes a better story) by a mob of frenzied shoppers fighting over Furby pets. We loved the year Sears gave out free $10.00 gift cards to the first person in line and we all came out with our purchases and hadn’t spent a dime of our own money. My daughter still has the slippers she bought that day and wears them proudly. Then there was the year we stood in a freezing cold Staples line and they brought everyone hot chocolate. The hot Styrofoam cup kept our hands warm while we stood in line and talked and laughed about how stupid it was to be standing outside in the freezing cold at five in the morning. One year our main priority was to hit the huge sock sale at Fred Meyers but when we entered the store we found it overflowing with bargain sock shoppers that we left without purchasing even one pair of socks. For the Wells family, Black Friday is an event and a rite of passage for pre-teens as they hope to be included in the early morning shopping spree. Make a plan. Decide in advance which stores have the best bargains for the most shoppers in your group. Leave your coat in the car and anything else that makes it difficult to maneuver through the store. Beat the system by shopping in teams. We always separate into teams and go after items that we want. One person (usually Uncle Steve) always heads for the check-out line so we don’t have to waste so much time waiting in line to check out. One final note to store and shop owners- please don’t ruin Black Friday shopping by opening your doors a week early and calling it a “pre Black Friday” sale. It seems that stores are opening earlier than ever and some have door busters slated for the day before Black Friday, letting you shop after Thanksgiving dinner. 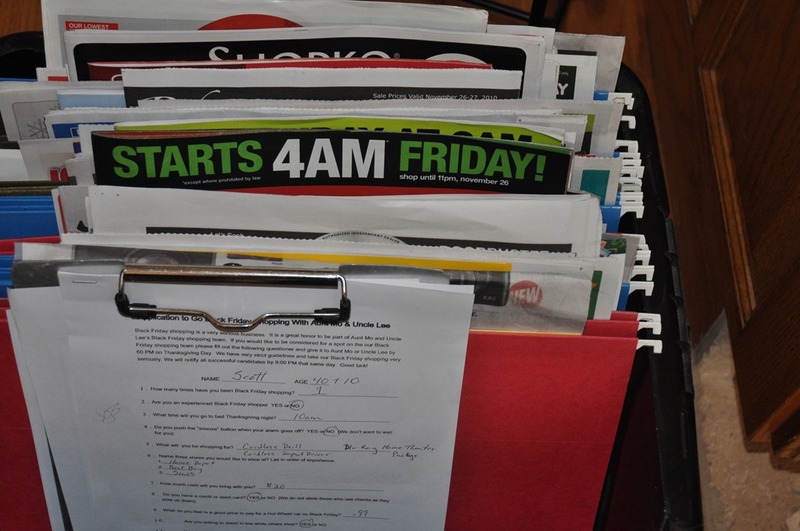 I guess you’d say I am a purest- I like Black Friday where it’s supposed to be- the day after Thanksgiving, very early in the morning and surrounded by my family- at least those that filled out a Black Friday shopping application. Black Friday shopping is a very serious business. It is a great honor to be part of Aunt Mo and Uncle Lee’s Black Friday shopping team. If you would like to be considered for a spot on the our Black Friday shopping team please fill out the following questioner and give it to Aunt Mo or Uncle Lee by 6:00 PM on Thanksgiving Day. We have very strict guidelines and take our Black Friday shopping very seriously. We will notify all successful candidates by 9:00 PM that same day. Good luck! 6. Name three stores you would like to shop at? List in order of importance. Please attach one letter of reference to this form. Thank you for applying to be part of our Black Friday team. We will contact you by 9:00 PM Thanksgiving night. If you’ve played “Cops & Robbers you can play “Turkeys and Robbers”. Feeling a little “stuffed” after your Thanksgiving dinner? 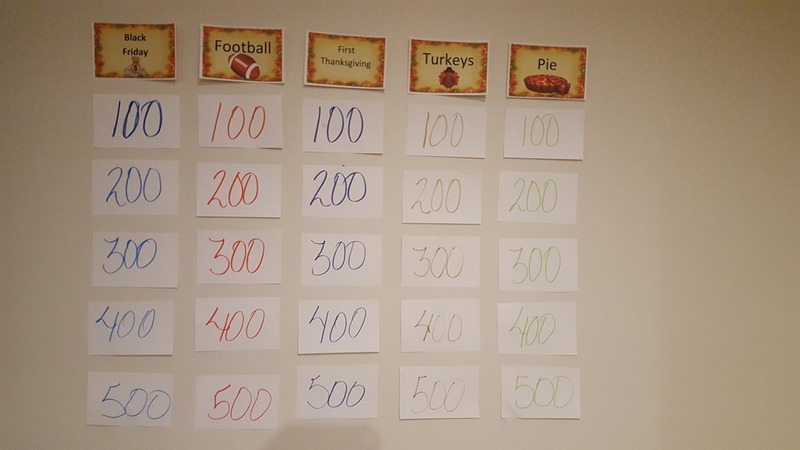 Here’s a fun game to get your Thanksgiving guests up and moving. Before you know it they’ll be ready for pumpkin pie. Divide participants into two groups-the "Turkeys" and the "Robbers." If you have an odd number of people, add extra people to the robbers. It is better to have more robbers than turkeys. Make a “nest” for your turkey eggs by making a circle (hula hoop) and placing soft balls or bean bags in the center. Start with three “eggs” but for a longer game you use more eggs. Mark off an area to be the "barnyard". When a turkey tags a robber they take the robber to the barnyard. The barnyard could be a tree or an area you mark off. Mark off a home base for the robbers. Turkeys may not enter the home base. Robbers can get their friends out of the barnyard by touching them. To win the game, the robbers must take the eggs while not getting captured by the turkeys. 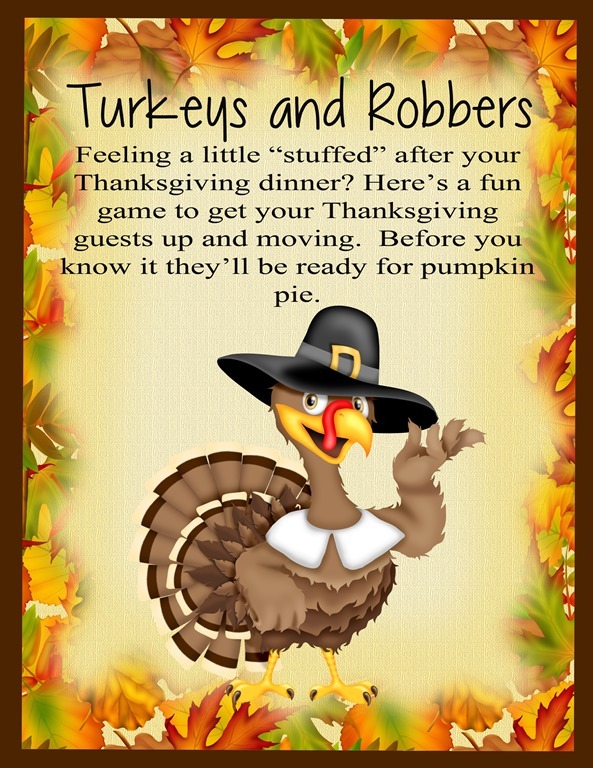 The turkeys can tag the robbers to remove them from the game or send them to the barnyard (jail). The robbers win if they successfully steal the turkey eggs and take them back to their "home base." The turkeys will win the game if they capture all of the robbers and send them to the barnyard. You will need to decide if the robbers can throw the turkey eggs from one another to keep them from the turkeys. We like that option especially when playing with an older group. If a robber is tagged while running back to the safe zone with a turkey egg, the turkeys must return the object directly to their nest. At no other time may the turkeys carry the eggs. Turkeys and Robbers is basically just Cops and Robbers with a Thanksgiving twist. There are many variations to the game and I’m sure you have your favorite rules so feel free to tweak as necessary. For instance,you may want to create a safety zone around the nest for the robbers or decide on a time limit for robbers to be inside any of the safety zones. Whatever variations your family decides on, Turkeys and Robbers is a great way to burn off that stuffed feeling after you’ve gobbled up Tom Turkey and all the trimmings. If your reunion committee has the funds, purchase a few cars and at the end of your reunion auction them off or have a prize drawing. 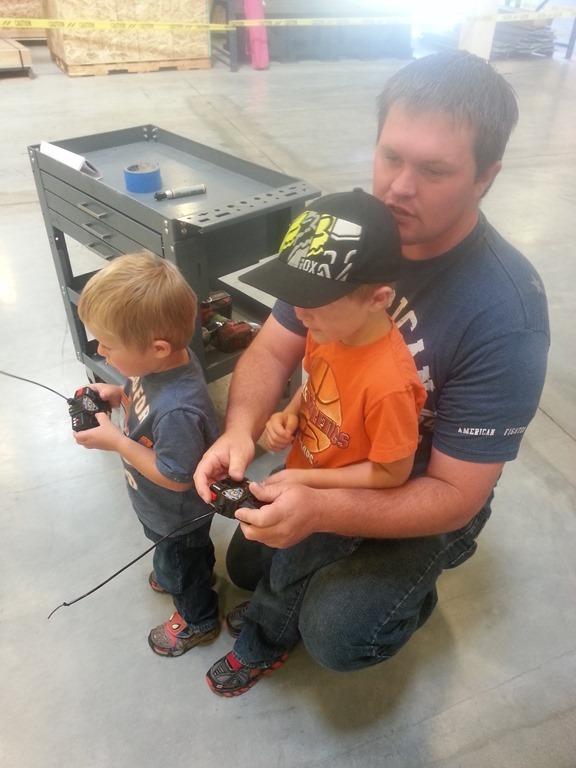 Another option is to invite family members to bring their own remote control cars to the reunion. If you’re planning in advance, a good time to purchase remote control cars in during the Thanksgiving Black Friday sales. First you have to decide if you want a dirt track or an inside track. As far as size goes, you won’t need more than a 20-foot by 20-foot area. 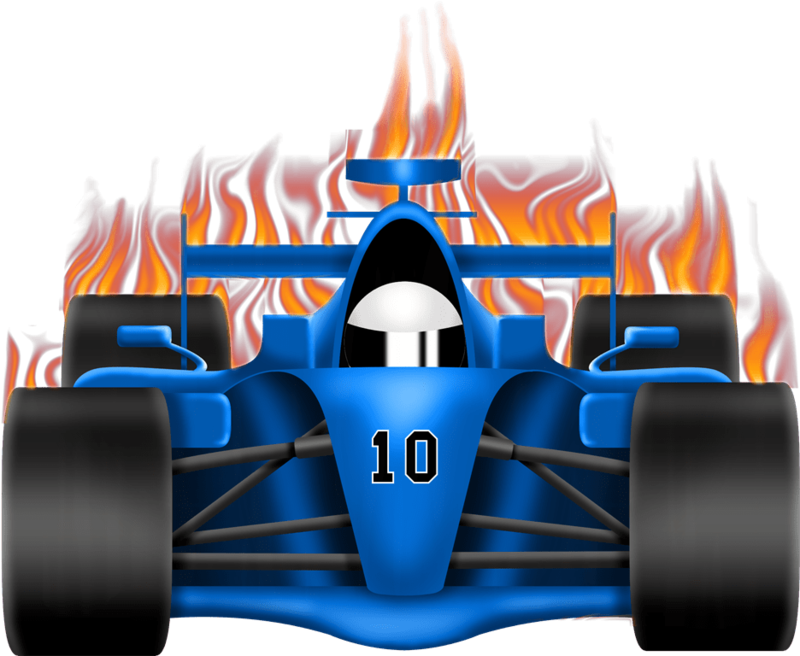 You can chart out the obvious oval course or focus on hard turns to make it more challenging. If you are racing on a hard surface, you can easily chart out the borders of the track using chalk or tape. 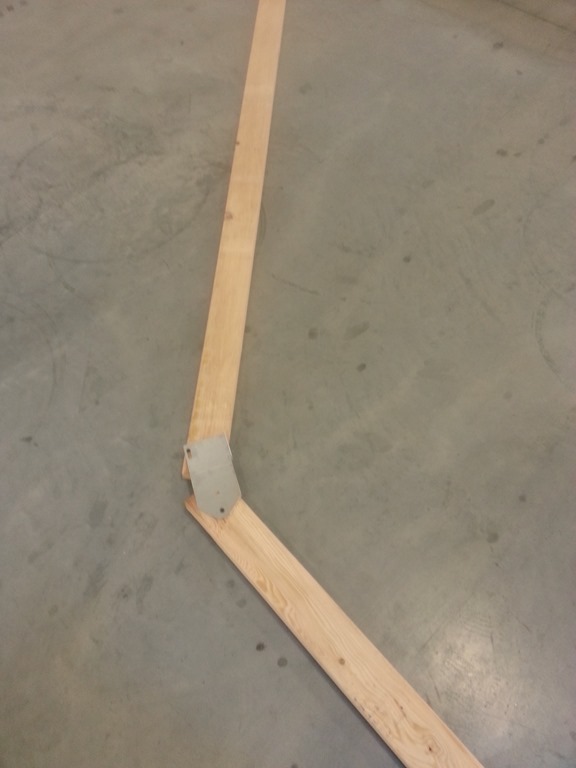 Use 2x4s to make a sturdy track. 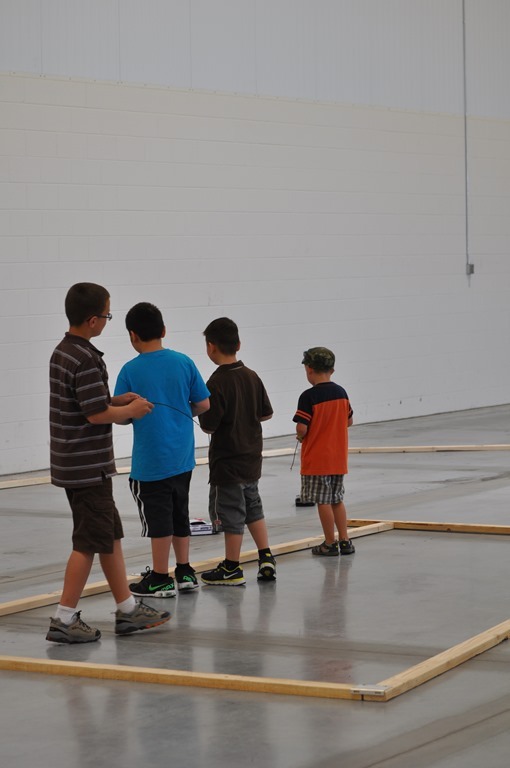 A garden hose may also be a solution to keep the RC cars on the track. Depending on how many cars and racers you have the track should be within 5 to 7 feet wide. A barrier in the center of your track helps keep cars roaring around the track and may help keep younger racers from getting stuck in the center. It can also be used as a control central for racers. Now it’s time to have some fun adding obstacles and jumps. If your car is a cheaper model, add only slight jumps but medium cost remote control cars can fly right over jumps without being damaged. You can use 2 liter bottles that you spray paint bright orange as obstacles. Put a little sand in each bottle and use them for obstacles to weave in and out off. (You can use orange cones but the smaller ones get pushed out of place.) 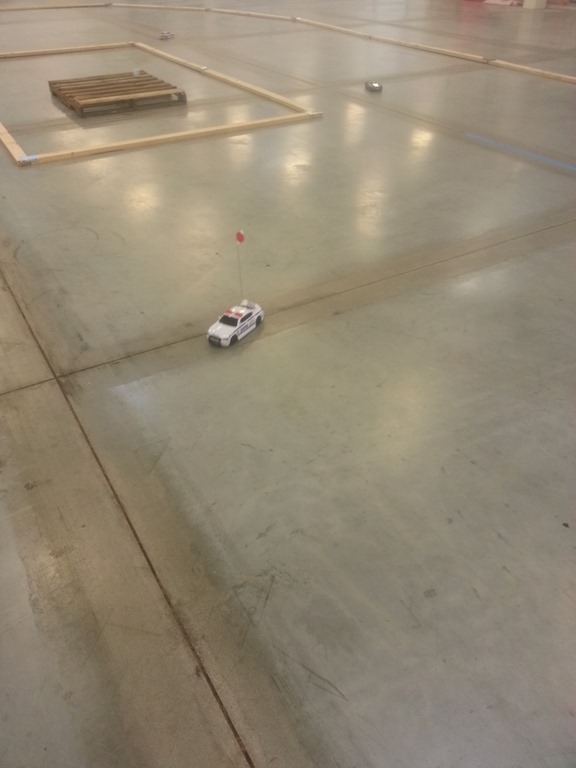 Another fun obstacle for your track is a tunnel made from plastic or metal that a remote control car can fit through. If you are creating a dirt track the pipe can also double as the base for a jump if dirt is piled around it. You will have to experiment to get the dirt at the right angle. Tunnels can also be made out of cardboard boxes. Have your track set up when reunion goers arrive. 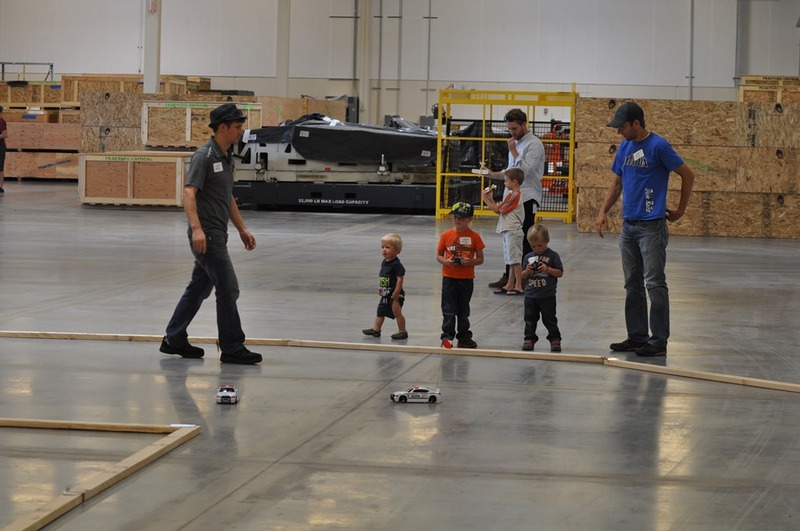 Invite them to practice racing cars around the track then choose a few cars to race for prizes at the end of the day. Gift bags of “Hot Wheel” and “Cars” goodies are fun awards. 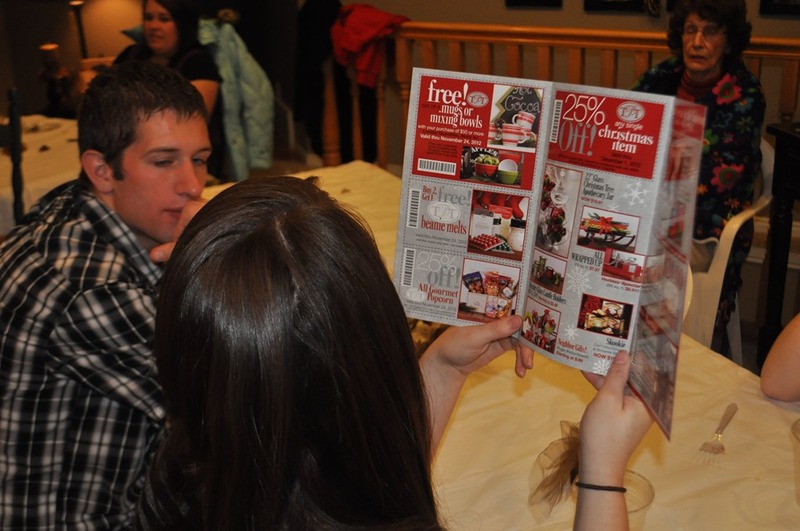 You can find race day printable invitations, decoration ideas,printable Pit Passes, water bottle (fuel) labels and award certificates in the familyreunionhelper store at Race Day Party. Whether for a family reunion or birthday party it’s a great party theme with plenty of ZOOM! I know that many of you are shaking your head in disgust right now- for many people staying up late or getting up in the wee hours of morning seems ridiculous to you. I’ll be the first to admit that you have to be a little (maybe a lot) crazy to get up early and be standing in a long line by 5 a.m.- in the cold, and the psycho crowds, but for me, it’s not about the bargains out there or the money I might save- it’s about the family memories we make.